(THE KOREA HERALD) - The season of outdoor picnics has dawned. If Western countries have the sandwich, Korea has gimbap as item of choice for dining alfresco in the park. A roll of gimbap -- rice, vegetables and other ingredients wrapped tightly in a seaweed laver sheet -- is considered both the classic picnic lunch and takeout food for Koreans. The typical gimbap consists of white rice, carrots, spinach, fried egg, ham, cucumber and yellow pickled radish. A timeless item on the lunch menu for Koreans, gimbap has also become a trendy meal in recent years. Various franchises that specialise in premium gimbap have popped up across the country. Specialty gimbap falls under the category of “small luxury,” sought after by youths or busy office workers who want a simple and cheap, yet nutritious meal, reports say. It’s also a part of the “premium fast food” boom that seeks to combine speed and convenience with health. The concept was selected as the food trend of the year by the Ministry of Agriculture, Food and Rural Affairs in 2017. Gimbap brands like Black Rolls are seeking to take the all-in-one finger food to the global market. The company has reinterpreted the gimbap to make it resemble a burrito, wrapping the seaweed roll in paper instead of slicing it into pieces. “We felt it was a type of food that could appeal to both Koreans and foreigners, while being at once healthy and convenient,” said Jo Jung-kyu, CEO of Black Rolls. The company plans to combine a drive-thru and beer and fries joint into its store concept. Currently, it is running an experimental store in Ilsan, Gyeonggi Province, to gather direct feedback from customers. A myriad of imaginative interpretations of gimbap are flooding the market, incorporating everything from nuts, anchovies, tuna and fried pork to abalone, cream cheese and even wasabi. The types of rice range include brown and black. Otto Gimbap, located on the hilltop of Seoul’s Usadan-ro in Yongsan, has achieved fame for its wasabi sauce roll. Founded in 2011 by retired businessman Kim Young-jae, the eatery now attracts gimbap fans from all over the country. Customers include mothers buying wholesome snacks for their children and vegetarians craving gimbap clear of meat. 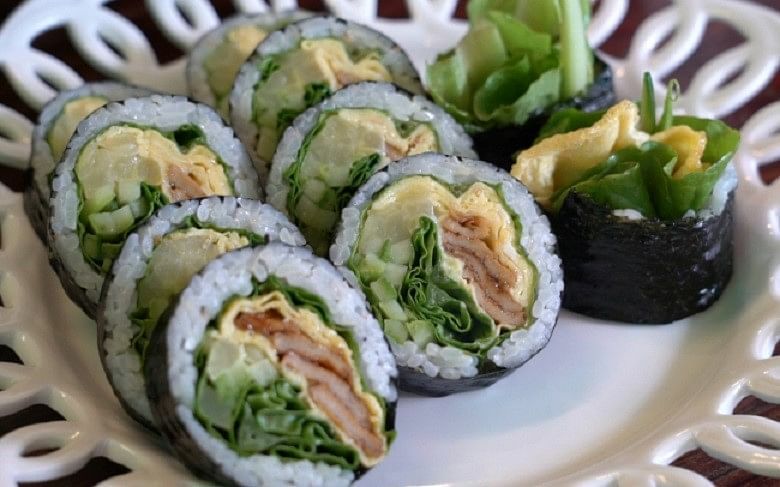 The signature wasabi gimbap, developed by Kim’s epicurean wife, consists of multiple layers of fresh romaine lettuce, fish cakes wrapped in fried egg and a sauce of wasabi and mayonnaise. Lee Gimbap, which opened in 2010, puts a contemporary spin on the timeless gimbap through its shops’ modern interior and novel ingredients such as edam and gouda cheese. Its signature items include spicy nut gimbap and chicken chili gimbap. Kobongmin is another premium gimbap franchise, whose motto is “You are what you eat,” focusing on fresh, healthy ingredients. It requires its franchisees to decorate their interiors with wooden walls and tables to emphasize its natural theme. Kobongmin’s menu includes pork cutlets, tuna, spicy chicken and cream cheese-mango-cashew gimbap.